Damian Williams has the ability to become a primary WR in the NFL, but does he have the mindset? Photo by Nathan Rupert. Last week, I wrote about the great emotional divide that NFL prospects must cross in order to transition from college talent to productive pro player. 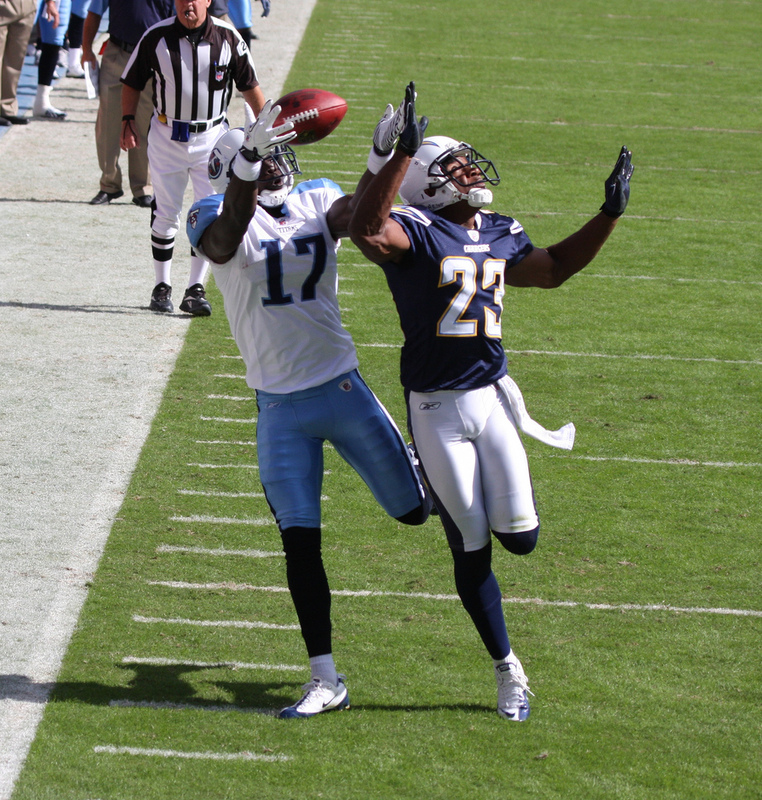 A player currently attempting to cross this divide is Titans wide receiver Damian Williams, a third-round pick in the 2010 NFL Draft currently starting in place of the injured Kenny Britt. Williams epitomizes a player balancing precariously on the line separating a breakthrough and a breakdown. I’m not saying Williams is emotionally unstable. In fact, it appears he’s a pretty smart guy. However, two news stories reveal that Williams is a talented young man still trying to find his way as a professional athlete both on and off the field. With the right kind of self-awareness to learn from his mistakes and good mentoring from veterans with a stable approach to life like Matt Hasselbeck, Williams can become a good NFL starter. But even a reasonably smart young man can get into potentially dangerous or complicated off-field situations that could make Williams will just become another former college star with a brief NFL career. In June, Williams as a victim of extortion. In the presence of police detectives, Williams arranged a meeting with 22-year-old Shelley Anne David in a parking lot. She had text Williams with an offer not to testify against him in a misdemeanor assault cause in exchange for a $5000 payment via cashier’s check. Williams allegedly bruised David during an argument where he grabbed her by the arms to remove her from his bedroom after they and other friends/acquaintances returned to Williams’ apartment from a nightclub earlier that month. David called the police to her apartment the next afternoon to file charges. Williams did a good job of handling the aftermath of the initial charges and cooperating with the Nashville police during the investigation, which resulted in the authorities dropping misdemeanor charges that were initially filed against him. Nevertheless, this is the exact kind of scenario that young pro athletes are warned about. It has been reported that David was Williams’ girlfriend at the time, which makes their late night out together with friends during the off season seem all the more reasonable for the average young couple. However, if David was his companion it casts a further pall over the difficulty athletes face to make good decisions off the field. Most of us in our early 20s weren’t labeled negatively at the office or school if we stayed out late at a nightclub with a girlfriend. Yet one publicized incident like this and Williams could easily be perceived as a slacker even when it happened during the evening in the off season. I don’t know about you but it was tempting to be out late and having a good time in the company of women. And I was as far from a rich professional athlete as you could get. What I think most of us can’t comprehend is a girlfriend trying to extort us. The one thing Williams probably should have done is called the police and had the woman removed from his house rather than do it himself. However, if she was his girlfriend the idea of calling the police on her was not even a thought that registered in his mind. Clearly it should have – even if the scenario seemed ridiculous. But just ask yourself if you would have thought to call the police. I doubt I would have. Unless we learn of future off the field issues involving Williams it’s safe to conclude Williams dodged a bullet and did a good job of handling a difficult situation. He’ll do a better job if he learned from the experience to be more mindful of whom he brings into his world because these kinds of distractions can preoccupy the thoughts of the average 9-5er to effect his job. It’s even worse for a young employee trying to prove himself and earn bigger role with the team. Interestingly enough, it appears that Williams’ off-field life isn’t a real issue. In fact, according to his wide receiver’s coach – former Louisville star QB Dave Ragone – Williams is a well-prepared, conscientious member of the team. The actual problem could have more to do with him being too hard on himself. A solid college route runner capable of telling a succinct, but suspenseful story to a defender that leads to a successful break. A flexible athlete who can adjust to the football high, low, or away from his body to win the football. A runner with the vision and moves to set up defenders in the open field. When Jeff Fisher’s regime drafted Williams in the third round, they thought they got a bargain because they attempted to trade up to land him a round earlier. Williams’ first year had some moments of promise. He made a number of good plays in the middle of the field as an intermediate route runner and if not for some minor injuries (hamstring and ribs) in the preseason that bled into the beginning of the year, the second-year veteran might have made things more interesting competing for Nate Washington’s job. Once he understands that this is where he is supposed to be, that he doesn’t second-guess himself, and he plays up to the ability, he is going to be an awesome player,” Washington said. “He has questions in his mind, doubts himself sometimes I am pretty sure. It is hard. But can he come in and play this position? No doubt. He is a good player and we have every bit of confidence in him. He has waited for this situation for a while. Williams actually confessed in this article that he’s a perfectionist and gets down on himself when he makes a mistake. This kind of confidence issue is a perfect example of a young player’s tendency to over think the game rather than just playing the game. Williams flashed some of that potential this weekend with a diving TD reception. With former second-round pick Donnie Avery likely to earn time as a vertical threat, Williams could earn even more optimal match ups in this offense.